With the rapid deployment of high speed fiber multiplexer, the possibility of having an un-terminated derived channel or branch increases. The single fiber connector mated to an unused adapter or coupling is the source of back-reflection. The fiber optic terminator is usually used to terminate the unused fiber connector ports in fiber optic systems. Such unused ports will create unwanted return loss and degrade the whole network performance. Fiber optic terminators are passive components that can absorb light coming from the unterminated connectors plugs and reduce signal degradation in digital and analog systems. Fiber optic terminators are designed to reduce back-reflections, which is typically found on laser-activated, connectorized access points such as those found on splitters, DWDM’s or fiber distribution frames. are functional devices using Metal-Ion Doped Fibers. By using these fibers, optical terminators can convert the optical power into heat and the power is attenuated inside the devices. The structures of the plug type optical terminators are simple and the power-proof and performance stability is superior. The fiber optic terminators also maintain the cleanliness of unterminated plugs and protect them from possible physical damage. The plug type optical terminators are used to terminate dark fiber port on the fiber optic component. Their ceramic ferrule is polished with an angled or non-angled end face to reduce unwanted reflections from open ports. These optical terminator also provide improved personal safety over termination methods. 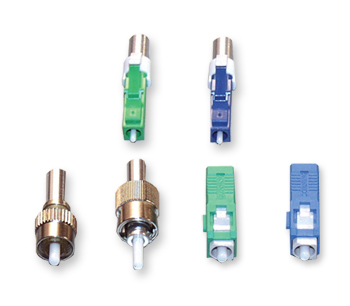 FiberStore provides all types of optical fiber terminators including SC, FC, ST, LC and MU type connector with high precision ceramic ferrule. They can be easily plugged into the systems to significantly reduce reflections from the fiber face, they can also be used with fiber adapters at the male plug end. Besides, FiberStore also provide the mechanical fiber optic termination tools such including fiber optic crimp tool to crimp or connect a connector to the end of a fiber optic cable. Fiber optic patch cable is an important cable component for fiber optic networks, the armored fiber optic patch cables are specially designed for harsh environment in in aerospace, automotive, industrial, medical, and military applications. FiberStore provides a huge selection of armored fiber optic patch cables in any configuration, with any connectors types, cable modes, and lengths. Armored fiber patch cable is a round, compact and very tough duplex patch cable with flexible armouring under PVC or LSZH jacket, providing exceptional crush and kinking resistance. Armored fiber patch cord is different from standard fiber optic patch cables, the very commonly used fiber optic patch cables structures is like this: fiber glass core in the center of the cable, cladding outside the fiberglass for protection, Kevlar outside the cladding, Kevlar is soft as well as very strong material, then the outside is the cable jacket. Traditional fiber optic patch cords are tender equipment, people cannot bend it too much or the fiberglass will be damaged and broken, which is not suitable for harsh environment. Armored fiber optic patch cables are with the same types of fiber optic connectors as the commonly used types, the difference is the cable itself. Armored fiber optic cables are typically used for indoor applications, with the same outer diameter of common types 2mm or 3mm. The difference is armored fiber optic cables are with stainless steel tape just inside the cable jacket and outside the Kevlar, this stainless unit provides extra feature as well as retain all the function that a common type optical fiber patch cable can give. What’s more, armored fiber optic cords are anti-rodent, and it can be handled as electric cables. It is not easy to get damaged or cut, and it can resist an adult step on it. FiberStore supply armored fiber optic patch cables, including 10G OM4/OM3, 9/125, 62.5/125 types. 10G fiber patch cables provide 10 gigabyte data transfer speeds in high bandwidth applications and they are 5 times faster than standard 50um fiber cable. All armored fiber patch cable types can be with SC, ST, FC, LC, MU, SC/APC, ST/APC, LC/APC, etc. types of terminations. Fiber cores: Simplex, duplex, 4 fibers, 8 fibers etc.